Am I the only one who's sick of the whole blending-of-names thing? Bennifer? Blah. Brangelina? Gag. Thanks to them, I can never date a fella named Ross (Gross! ), a dude called Brody (Grody! ), or any Hispanic studs known as Jaime (Grimy!). When it's applied to food, though, I don't mind the name-blending so much. Case in point: Banoffee pie. Part banana, part toffee, and total treat, this creation never fails to satisfy. As I'm currently in full-blown cupcake mode, I used the banoffee pie as inspiration for my latest batch. Banana cupcakes formed the base, a glob of dulce de leche was squished into the middle to form the filling, and smooth, rich caramel buttercream topped things off. I also sprinkled toffee bits over the frosting, just because I could. By the way, I'll bet most of you have read about The Fairy Hobmother at some point. Guess what--she dropped in on me after I left a comment on this post. If you leave a comment here, you may be next! To make the cupcakes, first preheat the oven to 350 degrees. Line standard muffin tins with paper liners. Whisk flour, baking soda, baking powder, salt, and cinnamon in a large bowl. In another bowl, whisk together bananas, buttermilk, and vanilla. Cream the butter and sugar with a mixer until light and fluffy. Add eggs, 1 at a time, beating after each addition. Add the dry ingredients to the butter mixture in 3 additions, alternating with the banana mixture and ending with dry, making sure to scrape the sides of the bowl. Divide batter among muffin cups, filling each 3/4 full. Bake until testers inserted into centers come out clean, about 20 minutes. Let cool in tins on wire racks. Once cool, carve out a cone from the top of each cupcake; fill the hole with dulce de leche. 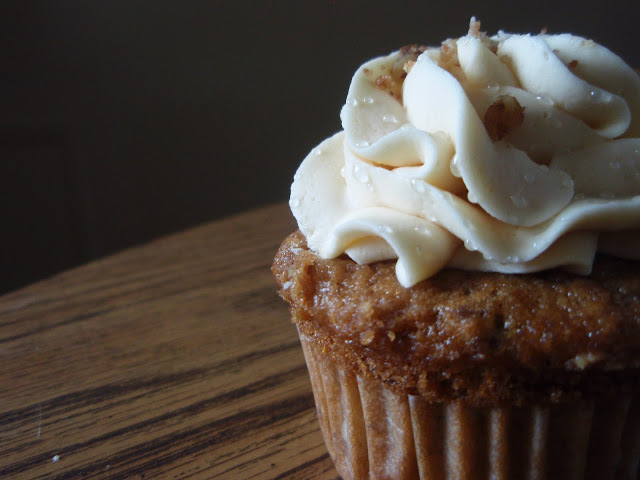 To make the frosting, with an electric mixer, beat butter on medium-high speed until pale and creamy, about 2 minutes. Reduce speed to medium. Add the powdered sugar, 1/2 cup at a time, beating well after each addition and scraping down sides of bowl as needed; after every two additions, raise speed to high and beat 10 seconds to aerate frosting, then return to medium-high. This process should take about 5 minutes. Frosting will be very pale and fluffy. Add vanilla and dulce de leche, and beat until frosting is smooth. Pipe onto cupcakes and sprinkle with toffee bits. caramel butter cream sounds amazing!!! I'm so glad you're on a cupcake binge, I'm enjoying it so much. I could stare at your cupcake photos forever. Oh my gosh. I want these so bad. Almost bad enough to attempt baking. But really, it would be ever so nice if just sent some my way. Holy cow woman! You are truly brilliant... this is a MUST MAKE. Now if only they had no calories. Sigh. I agree with you with the naming thing. It seems like it takes away the person's individuality, aside from being absolutely ridiculous. And people accidentally refer to my husband and myself as "Timily" Tim and Emily. Purely accidental (and altogether amusing because of its frequency), but it happens so often, that it reminds me of the silly couple-naming nonsense! You are hilarious, Grace. Really. I love the Banoffee flavor combo...but I'll be honest, never tried it out myself. Just devoured others creations. I love it in cupcake form. I bet I could just consume th bowl of the caramel buttercream frosting! I agree. THe worst thing is that the general public call them these silly names too. I also agree about banoffi though, and these are going on the autumn list! You are a cake genius. LOL I hate the celebrity names as well! And Brody *ugh* that just sounds d**chey 8). These cupcakes on the other hand look just right for my tastes ;p.
Banoffee rings delicious to me! Oh my gosh these cupcakes are beautiful. I wish I had one right now! I bet they tastes wonderful. These are just perfect! sure wish I had one right now. On an airplane at 40,000 feet and hungry. I think you can date someone called Ross and forge an independent identity. I agree, it's ridiculous. Besides, does anyone really care about them? Enough to give them nicknames? But you've got a winning name combo here, Grace! These look fabulous! Ooohh... great minds think alike. I just made a peanut butter cupcake with chocolate frosting and a gob of dulce sandwiched in the middle. Caramel makes everything better. Gorgeous cupcake Grace! These are worthy of the blended name- they look awesome! Wow! I am drooling! I love dulce de leche and it is an ingredient I always have. These look absolutely fantastic. Your cupcakes look terrific! And I loved your analysis of who you can and can't date. So funny! This is one over the top good cupcake i think your interpretation of banoffee pie in cupcake form is drool worthy for sure. Those cupcakes look too good not to make, must be heavenly delicious! You do love your words! ;) I would never have thought of such name combinations! Or such a delicious sounding cupcake flavour combination :D I've never had banoffee pie before, but this looks delicious- especially with the dulce de leche filling! This is mouth watering goodness. I can't wait to try it. The photo is magnificent by the way. I love banoffee pie! These sound even awesomer. Dulce de leche and caramel buttercream! I do love banana cake, but really anything underneath those toppings would be fine. Love this! I love using dulce de leche. Thanks for the new recipe and inspiration for my next baking frenzy. Hello. I just stumbled across your blog and I have to tell you....I love it! I simply love your humor, your stories and your recipes of course. I myself have a food blog and try to make a story out of each of my postings, and I must say, your blog is so fun and clever! What a great job. High Five to you. I can't wait to browse your recipes! I am absolutely in love with this combination of flavours. This is the kind of cupcake thatwould cause fights to break out in my home. Yeah, the whole combining names thing is SO a few years ago. Except banoffee...that's so get-in-my-belly-this-instant. I've been in the cupcakes mode also this week. What a great mix, I want to try this recipe. Congrats for the visit!!! but whatever you call it, I LOVE toffee and this looks so delicious. I am sure this was Yumm-O,as the Queen of shortened cooking would say, Grace despite its shortened cutesy name. Congrats also for being visisted by the Fairy Hobmother.She rocks!! I've never tried banoffee anything but I loooove the sound of these with all the caramel yum! Looks gorgeous too. 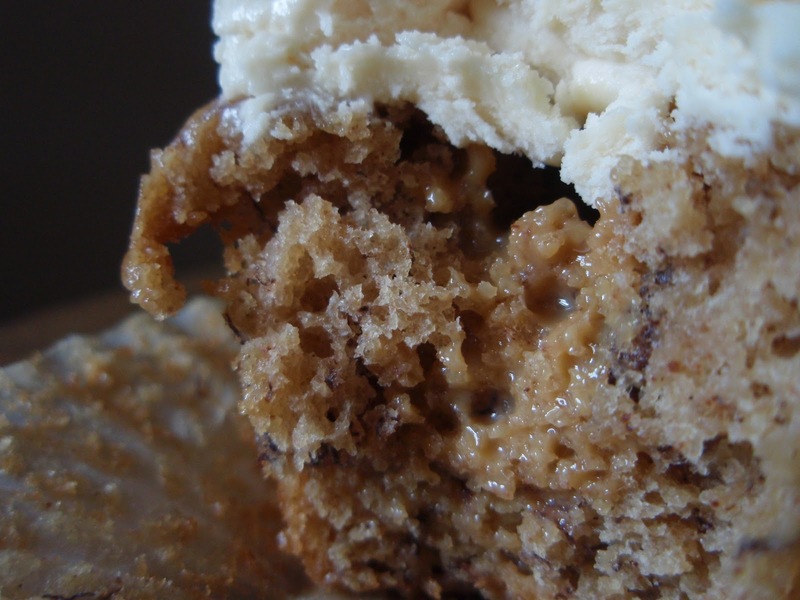 I love the idea of banoffee cupcakes! Espcially stuffed with luscious dulce de leche, yum! How 'bout goofy words like yummo and delish? Ok when it comes to food I guess. Well this is yummericious! Wow - looks amazing! I actually have some banana dulche de leche waiting in my cupboard....I think it's time I pull it out and try some of these. Gomph! That looks so very tasty. I so want to try this recipe! It looks positively devine!